Make sure the refrigerated pie crust dough is thawed/softened. Roll it out – you may want to use a roller to roll it out a bit thinner if you prefer these to not be too thick. Take your cookie cutter and cut out into the shape you desire – you will need a top & bottom shape for each pie. Add a little water to the egg white & stir. Then use a pastry brush to brush on egg whites on the inside of each of the shapes. 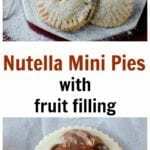 Use your choice of chocolate on the inside – either spread Nutella around the dough or place a chocolate candy or a small handful of chocolate chips in the middle. If you’d rather use chocolate chips, you could just sprinkle a handful of them all around the dough shape to get the taste of chocolate throughout the mini pie. Place the 2nd piece of pie dough on top. Squeeze it together with the bottom dough. Use a fork to crimp the edges, which help it stay together. Cut a vent in the top for baking. Brush the top of the mini pie with the egg white. Bake for 11 – 13 minutes (it will depend on your pie crust dough & your oven, though, so watch it carefully until it’s just turning brown}. Sprinkle with powdered sugar right before serving – this gives them such a sweet look & an extra bit of sweetness too.